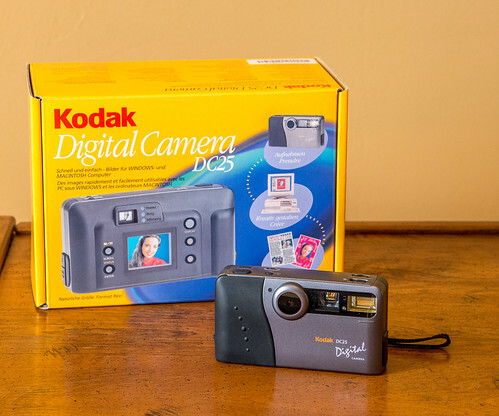 The DC25 is a early digital camera released by Kodak in 1996. It features a fixed focus lens which has a range of 0.5m to infinity. Photos can be captured in 320 x 240 pixels or a higher resolution 493 x 373 pixels. There is 2MB of internal storage which can hold 29 standard or 14 high resolution photos. Images are stored in a K25(raw) format. Removable storage is possible with Picture Cards (Compact Flash). It is the first consumer digital camera that uses CF cards. Photos can be transferred from the internal memory onto the flash card. Photos can be selected and individually erased. There is a built-in flash with a range of 0.5m to 4m. Flash modes include auto, fill and off modes. The optical viewfinder is used for composing the photo. Use the inner frame lines for subjects 0.5 to 1m, use the entire frame for subjects over 1m. 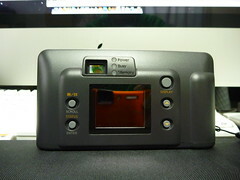 There is a colour LCD display used for displaying photos. Photos can be displayed in single or quad mode. Press the up or down buttons to browse the photos. There is a brightness knob on the base of the camera. The LCD will automatically turn off after 60 seconds to conserve power. Connectivity is with a serial port which can be adapted to 9 pin (windows). It is powered by two CR123A battery. The camera will automatically turn off if inactive for 90 seconds. This page was last edited on 18 April 2018, at 17:29.